One cold morning in February of 1929, five curators at the American Museum of Natural History in New York received a brief memo upon their desks. “Gentlemen,” the note reads, “With the approval of the president, I hereby appoint you members of an Advisory Committee on the Biological Aspects of Museum Groups…The purpose of appointing this Committee is to see what can be done to present more biological facts in the groups as now proposed for these halls.” The Committee convened several times over the course of the next two years to review the existing and future museum displays. But unlike other formal groups of Museum staff, it is absent from the public reports of the Museum. And two years later, just as suddenly as it was established, it disappears from the archives. It’s unclear whether, over the course of their short project, the Committee had any impact at all. But the volatility of their correspondence—indeed, even the existence of the Committee in the first place—provides insight into the Museum’s tumultuous decision-making process about how to display biology. The Committee’s directive was deceptively simple: try to re-imagine, from the concept all the way to the display, what kinds of biological information could be conveyed to a general audience. As a vanguard in both research and public communication of science, the American Museum of Natural History played a major role in defining the field of biology. But by 1929, that definition was changing. As the curators attempted to tell increasingly complex stories—including ecological, evolutionary, and behavioral dynamics—they worried that the public would not grasp the information. Simultaneously, as the Museum expanded in size and scope—adding departments, staff, and exhibit space—the central management struggled to coordinate between departments. The Museum’s anxiety facing these twin challenges of scale caused them to assemble a formal committee to assess and control the visual storytelling practices in the exhibits. But what was a “biological fact”? Why did the Museum distrust their public? And why was a committee formed when the Museum already relied on the extensive expertise and experience of an entire staff of curators? In the early Committee proceedings, William Gregory, curator of Comparative Anatomy, pointed out that the curators used the word “biology” in two starkly different ways—sometimes to refer to the physiology and life history of an organism, and sometimes to refer to ecological relationships. In the 1920s, the field of biology as a whole was in a period of redefinition. Biologists wrestled to reconcile 19th century Darwinian evolutionary theory with newer concepts of ecology. Secondary schools had only begun to teach a unified “biology” two decades earlier, condensed from the disparate fields of botany, zoology, and physiology. The Committee formed just four years after the Museum curators concluded their heavy involvement in the Scopes Trial, the first legal challenge to laws prohibiting public schools from teaching evolution. These dramatic national changes forced scientists and laypeople alike to confront the stories told about biological sciences. As the biological sciences themselves changed, the Museum began trying to tell stories that incorporated more “biological aspects.” The Committee formed in the midst of a gradual transition into more dynamic, engaging displays. In the 19th century, displays were usually long glass cases of individual fossils and taxidermied specimens mounted and meticulously labeled. But starting in the early 20th century, the Museum began to use more “group displays” which showed specimens gathered together and interacting in order to showcase ecological relationships as well as physiology. Karen Wonders, Karen Rader, and Victoria Cain have pointed out that group displays were initially viewed as less prestigious, associated more with fairs and other popular entertainment than the austerity of the museum space. As the curators incorporated group displays, the displays acquired more esteem while allowing the Museum to attract a wider audience with more sensational visual storytelling. In Gregory’s mind, the “function” of the museum was to make science “attractive to intelligent people.” As he wrote in 1929, “It is not necessary to make science repugnant in order to teach basic principles. Let us rise above dry technicalities and state broad and well established scientific results in simple language and in arresting exhibits.” Gregory’s “intelligent people” ranged from working-class museum visitors to elite donors. In addition to attracting a more popular audience, the group displays appealed to the elite as a way to glorify their hunting expeditions by publicly exhibiting their spoils. But not all curators embraced this tenuous relationship. Harold Anthony, curator of Mammology, resented the Committee’s description of mammals as “trophy groups,” and retorted that Mammology had no display “showing a dead animal with a rifle couched against the beast.” He pointed instead to the Department of Marine Life, arguing that their display portrayed a sail fish “vainly endeavoring to shake a hook that is impaled in its jaw. 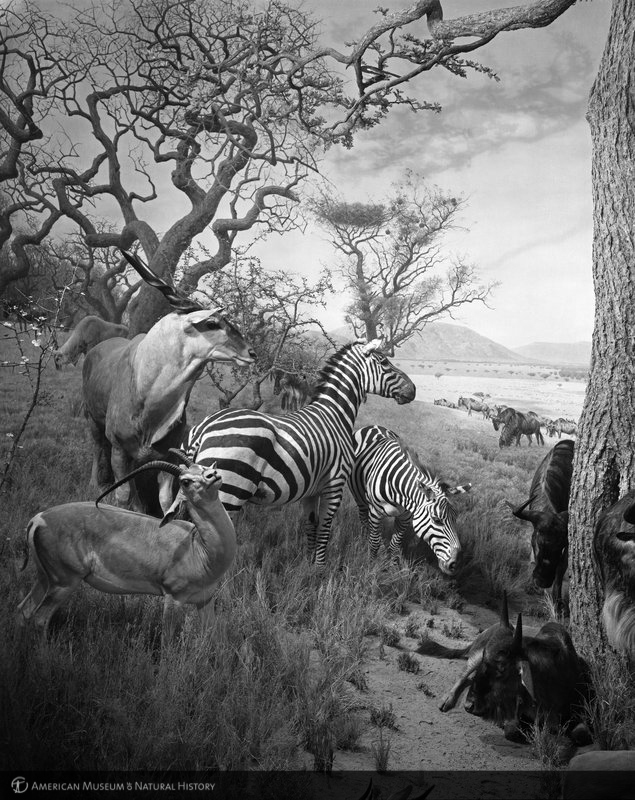 Could any group be more thoroughly a trophy group of a sportsman’s display?” The Committee was “diplomatically limited”—they had to placate wealthy patrons who expected the “beauty and grandeur of a large hall with spectacular habitat groups.” As Donna Haraway and Gregg Mitman have argued, this often led to a valorization of trophy hunting. In all these debates, the curators balanced their hope “to stimulate biological spirit” with a more sober presentation of biological facts. As they designed the new group displays the curators were forced to evaluate what they felt the public was capable of understanding in the first place. This was cause for some debate: The complexity of an ecosystem posed an obstacle to clear, simple stories. The curator of invertebrate zoology argued that the exhibits were only capable of showing how specimens interacted in their habitat; other aspects of the natural history, for example, family structure, “might only be brought out in the labels.” James Clark, a member of the Committee and head of the Preparation Department, saw display and information as a trade-off, proposing a compromise of “50% biology and 50% picture.” Gregory “doubted whether the public saw even the ecological relationships in the mammal and bird groups.” The curators were unsure of their power to communicate, and the Committee hoped to direct this process of experimentation. The African Hall. American Museum of Natural History Library, images 310841 & 314207. The volatility of the reactions tell a story about the centralization of knowledge production—the Museum used the Committee as a desperate attempt to control and standardize a process and a story of increasing complexity. The Museum functioned as a public institution, and used the same techniques of bureaucratization that corporations were using at the time in a desperate “search for order,” in the words of Robert Wiebe. As institutions became larger and took on more different functions, bureaucracy—including the technique of forming committees—functioned as what Alfred Chandler Jr. has called a “visible hand” to coordinate the various functions of the institution. It’s impossible to know why exactly the Committee disbanded and disappeared from the archive. Ultimately, it’s unclear whether they had any real impact on the museum displays. The Committee focused on incorporating more ecological dynamics, but the archive shows that curators considered ecological dynamics as a major goal in the decade before the Committee was convened. The Committee attempted to search for order over an increasingly complex story, but they struggled to define the meaning of “biology,” let alone “fact.” They did not find the language to define any sweeping new policy for museum exhibits. With such a broad mandate as determining “biological facts,” they may have been using words so big that they meant nothing at all. *Photos and archival materials are reproduced courtesy of AMNH Special Collections.